The Cubs call up outfielder Andy Pafko from their Los Angeles minor league team, and put him in the lineup. He would remain there for the next eight seasons. His first game at Wrigley Field is played in absolutely miserable weather conditions. It is freezing cold, the wind is howling, and the freezing rain causes umpires to call it after only five innings. An incredibly small crowd is on hand; only 314 fans. Andy Pafko goes 2 for 3, and drives in four runs. Cubs pitcher Frank Castillo pitches the best game of his life. He doesn’t give up a hit through eight innings, and goes into the top of the ninth inning with a 7-0 lead against the Cardinals. First he faces pinch hitter Terry Bradshaw and strikes him out for his 12th strikeout of the game. The second batter of the inning, pinch hitter Mark Sweeney, becomes his 13th victim. That brings up Bernard Gilkey. Wrigley Field is rockin’ as strike one was called. The fans are on the edge of their seats when Gilkey gets strike two. Castillo needs just one more strike to complete the no-hitter. Unfortunately, Bernard Gilkey isn’t playing along. He strokes the next pitch down the line for a triple, ending Castillo’s bid for immortality. Frank Castillo passed away in 2013 at the age of 49. September 24: In 1943 Andy Pafko makes his Cubs debut on a horrible weather day in front of only 314 fans…In 1975, Tom Seaver has a no-hitter going into the ninth inning, but Rick Reuschel is also pitching a shutout. Tarzan Wallis breaks up the no-hitter in the ninth, and the Cubs win it in the 11th on a bases loaded walk to Bill Madlock, 1-0. September 25: In 1934, Phil Cavarretta plays his first game at Wrigley Field and hits a homer on the first pitch he sees. It’s the only run of the game, as the Cubs beat the Reds 1-0…In 1966 Ken Holtzman has a no-hitter going into the 9th inning before giving up two hits to the Dodgers. The Cubs beat Sandy Koufax 2-1…1995: Frank Castillo tosses 8 and 2/3 no-hit innings before surrendering an opposite-field triple to Bernard Gilkey in 7-0 victory vs. St. Louis. (Full Story above) …In 2004, Latroy Hawkins blows a save and kills the season. Security footage shows Sammy Sosa leaving Wrigley Field 15 minutes after the start of the game. He later denies it…In 2015, Cubs lose to Pirates 3-2, but clinch a wildcard spot in the playoffs when the Giants lose to the A’s…In 2016, Cubs beat Cardinals 3-1 to win their 57th home game of the season–a franchise record. September 26: In 1961, the pennant is clinched…by the Reds. The Reds score five runs in the final three innings to win 6-3… In 1971, Ernie Banks plays his last game at Wrigley Field. He goes 1 for 3 in a loss to the Phillies. His last hit was a single to left, and his last at bat was a pop out to third baseman John Vukovich. 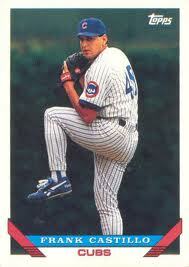 Vukovich later coached for the Cubs. September 27: In 1981, Jack Brickhouse broadcasts his final game from Wrigley…In 2003, the Cubs win a double header against the Pirates. Mark Prior wins the first game (his 18th win), and Matt Clement wins the second game (his 14th), and the Cubs clinch the divisional title. Sammy Sosa sprays the fans with champagne. September 28: In 1930, Hack Wilson records his 190th and 191st RBI in an 13-11 win over the Reds. 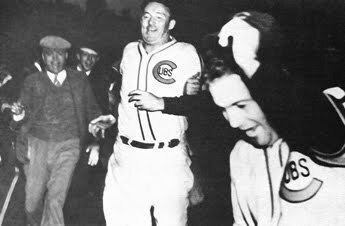 That remains the record to this day…In 1938 Gabby Hartnett hits the most famous home run in Wrigley history—the Homer in the Gloamin to defeat the Pirates and propel the Cubs to the pennant (full story below)…In 1995, a fan rushes the field to confront Randy Myers after he gives up a homer, and Myers decks him. In 1998, the Cubs play the Giants in a one-game playoff to determine the wild card winner. The Cubs win 5-3. Ex-Cub Joe Carter makes the final out. 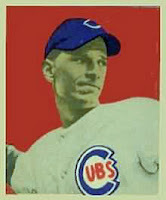 September 29: In 1922, Cubs pitcher Tiny Osborne throws a 2-hitter to defeat the Cardinals, 3-0. The first batter of the game hits a single, and nobody else gets a hit until the 7th inning. The three Cub runs are driven in by outfielders Cliff Heathcote and Turner Barber, and catcher Bob O’Farrell…In 2002, Sammy hits his 49th homer of the season to win his only home run title. It’s the 499th homer of his career. September 30: In 1942, the Cubs and White Sox play in their final “City Series”. For the previous 40 years, when neither team made the World Series, the Cubs and Sox played each other in a series. The White Sox dominated over the years, winning 19 of the 28 series, including the last one in 1942.. In 1962, Ken Hubbs, Ernie Banks, and Andre Rodgers pull off a triple play, and the Mets lose their record setting 120th game of the season. The Cubs aren’t gloating however, as they’ve lost 103 games themselves… In 1988, President Reagan is at Wrigley, and throws out the first pitch…In 1992, Greg Maddux wins his 20th game of the season (and his last as Cub for twelve years), as the Cubs beat the Pirates 6-0. The second place Cubs were playing the first place Pittsburgh Pirates at Wrigley Field. It was the bottom of the ninth, the score was tied 5-5, and Cubs catcher Gabby Hartnett stepped to the plate. The umpires were sure to call the game because of darkness if the Cubs didn’t score in the bottom of the inning. No one knows how Hartnett even saw that ball from Pittsburgh pitcher Mace Brown, but Gabby knocked it out of the park, in a moment that will always be remembered as the “Homer in the Gloamin.” The Cubs overtook the Pirates for first place, and clinched the pennant a few days later. All these years later, “The Homer in the Gloamin'” remains the second most famous home run in Wrigley Field history.